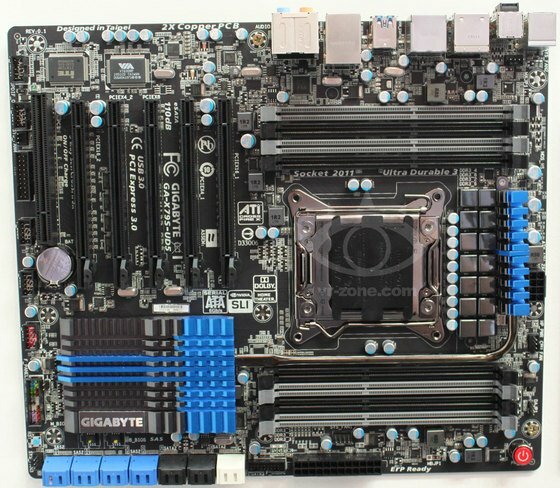 VR Zone got to see the Gigabyte GA-X79S-UD5, a new workstation motherboard based on the Intel C606 chipset. You can check it out over here, it supports the E5 Xeon processors as well as the consumer-level Core i7 processors. Gigabyte also told VR Zone that its current line of X79 motherboards have received a BIOS update that makes them compatible with the E5 Xeons. So what about the board? Well, it has five x16 PCI Express slots, of which two are full x16 slots, one is a x8 slot and two are x4 slots, although we're not sure if all are PCI Express 3.0. There's also a single PCI slot on the board. Add eight DIMM slots, four SATA 3Gbps and two SATA 6Gbps ports and you got a pretty high-end X79 board. However, thanks to the C606 chipset, the X79S-UD5 has eight native SAS ports, although sadly Intel was unable to deliver 6Gbps speeds in the end, so the ports are limited to speeds of 3Gbps. One important thing for anyone considering using this board with a Core i7 CPU is that the SAS ports won't work with this CPU, as it requires the extra four lanes of PCI Express 3.0 bandwidth available from the Xeon processors to work. The SAS controller isn't a true hardware RAID, but it features XOR processing, so it should help to offload the CPU a lot more than your average software RAID implementation.